Home › Answering Hadith-Rejecters › Are There Any Hadith Collections From Early Islam? None of the above collections are part of the so-called “Authentic Six”. We can see that of the 138 narrations in the Sahifa, 98 of them are faithfully witnessed in the later collections of al-Bukhari and Muslim, both through narrations of Abu Hurrairah and witnessing narrations from other Companions. We also see that all but two of the narrations are found in one section of the Musnad of Imam Ahmad, again witnessing the preservation of hadith and that earlier works were faithfully rendered in later documents. In regards to the Al-Sihah al-Sittah, two of these are actual Sahih that of bukhari and Muslim. The rest vary on authenticty but none are contain any fabricated sayings. The Ulama understand that these collections are the not the be all and end all. 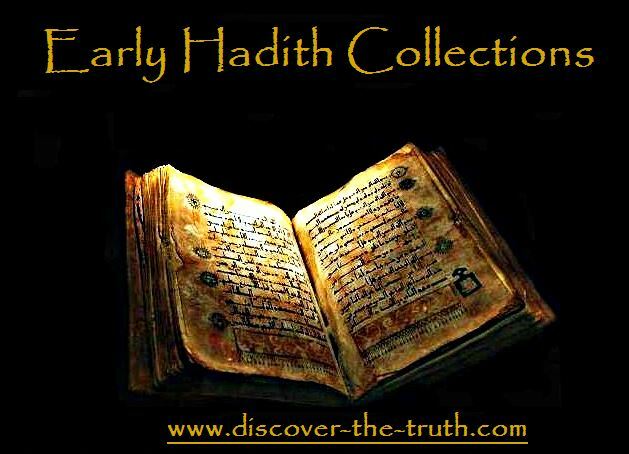 If I quote a hadith from the Mustadarak of Al-Hakim or the Musnad of Imam Ahmad just because they are not a part of these so called ‘six’ collections does nothing to the veracity of their collections. If you truly had researched this topic, you would have worked out that Abdul Razzaq was the teacher of both Bukhari and Muslim. Imam Malik and his Muwatta was considered the most authentic of its time and still remains so to this day. What people need to realise and understand is, is that alot of the older works where absorbed into bigger works. I hope this answers your worry. If at all it was indeed a worry. May peace and blessing be upon you. The point is that we are not relying on any of the earlier collections FIRST HAND. We are putting our trust and reliance in six persian hadith collections, containing SECOND-HAND INFORMATION, that came more than 200 years after the Prophet’s demise. It makes no sense to place reliance on second-hand “evidence” if first hand evidence is available and recorded much closer to the time of the Prophet’s demise. It is also pointless to mention hadith collections that are not relied on today. None of them are considered part of the so-called authentic collections. Why were all works never absorbed into just one work containing no fabricated hadith? I’m not a supporter of such an idea, but its a question worth asking. If that was true, it would be considered as part of the authentic collections, which it is not. If it does nothing to the veracity of Mustadarak of Al-Hakim or the Musnad of Imam Ahmad, they would be considered as part of the authentic collections, which they are not. Why would I want to consider something that is less authentic? Either something is authentic or it is not authentic. There cannot be varying degrees of authenticity. Does the Quran have verses of varying authenticity?? Why not once accept the truth? First it was they are written 200-300 years later, now it is proven, and now it is they are not a part of the so-called ” Authentic Six ”? And if we prove that they are, which can be and is done, then what will the excuse be? So you are saying that it can be proven that all “authentic” hadith collected within 200 years of the Prophet’s demise are absorbed into the Authentic Six? If that was true, hadith followers would not still be quoting other hadith collections, such as Malik’s Muwatta. As a reminder, the Manuscript that was mentioned earlier in this article is dated back to year 856H which is equivalent to the year 1452 AD. It is very late manuscript – check page 17 “http://pid.pusatkajianhadis.com/pdf/hd_shfh80.pdf” Please, research, revise and edit the article accordingly. Salam, have you got this in English? Well done brother. Jazak allahu kheir.